Saab owner Spyker reported a net loss of $55.4 million in the third quarter. STOCKHOLM (Bloomberg) -- Spyker Cars NV, the Dutch supercar maker that bought Saab in February, lowered this year's production forecast for the Swedish brand as the costs of the takeover led to a wider third-quarter loss. The net loss was 39.9 million euros ($55.4 million) compared with a 4.06 million-euro deficit a year earlier, Zeewolde, Netherlands,-based Spyker said Friday in a statement. Sales jumped to 275.5 million euros from 1.1 million euros as Saab began contributing revenue. Saab was on the brink of collapse until Spyker bought the Trollhattan-based carmaker from General Motors Co. The brand resumed production in March after a break of two months, and is focusing on rolling out the new 9-5 sedan. 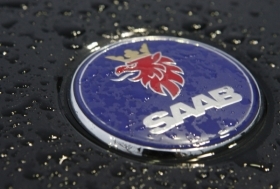 The Dutch parent company reiterated that it aims to become profitable in 2012 as Saab reaches 120,000 annual vehicle sales. Saab's production target for 2010 was cut to 30,000 to 35,000 cars from a plan in August to build 45,000 vehicles. Spyker said the unit has needed longer than expected to recover from the plant shutdown and start of liquidation proceedings early this year. The company also reiterated a goal of selling 80,000 cars in 2011. Spyker has gained 9.3 percent in Amsterdam trading since the company bought Saab on Feb. 23 for $74 million in cash and $326 million in preferred shares. Spyker CEO Victor Muller wants to list the company on the Stockholm exchange by about April 2011, he said Sept. 30. The shares would probably trade in both Amsterdam and Stockholm for a period and eventually delist from the Dutch market, Muller said. Spyker is turning to Russia and China to sell a range of new premium Saab models that it hopes will generate higher margins than under GM's ownership. Market expansion is the priority in this quarter and and the first quarter of 2011 and there are plans to have agreements in place for China and Russia before the end of the year, Spyker said. Last month, Spyker concluded a deal for Saab to use BMW AG four-cylinder 1.6-liter turbocharged gasoline engines for its new 9-3 model starting in 2012. At the end of the third quarter, Spyker's liquidity was 450 million euros ($625 million) including undrawn European Investment Bank facilities of 255 million euros. Spyker said Friday it is still finalizing its valuation of the Saab assets and that it was "not unreasonable" to expect the value to be adjusted upwards.